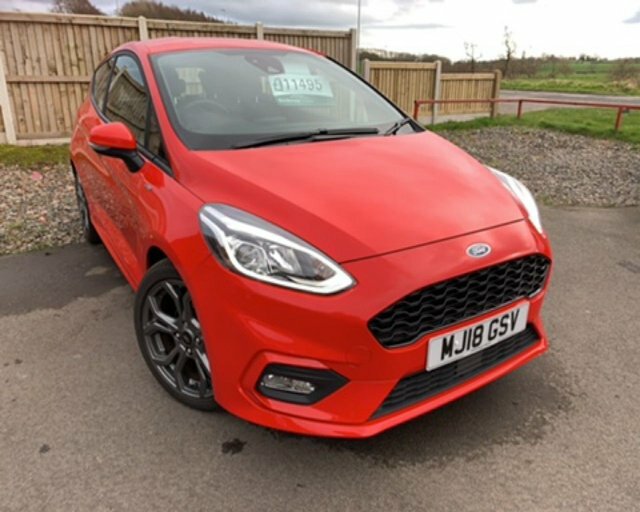 THIS RECENT ARRIVAL IN TO OUR STOCK IS A FORD FIESTA 1.0 ST-LINE 3-DOOR 125 BHP 6-SPEED MANUAL, FINISHED IN RACE RED WHICH IS COMPOLIMENTED BY A BLACK/ GREY PATTERNED CLOTH UPHOLSTERY. THERE HAS ONLY BEEN ONE REGISTERED KEEPER FROM NEW & IT COMES COMPLETE WITH A FULL SERVICE HISTORY. DUE TO THE EXTREMELY LOW CO2 EMISSIONS, THE ROAD TAX IS NIL COST !!! STANDARD SPECIFICATION INCLUDES BLUETOOTH CONNECTIVITY, 17 INCH 5-SPOKE ALLOY WHEELS FINISHED IN GRAPHITE GREY, DAB RADIO, QUICK CLEAR HEATED FRONT WINDSCREEN, AIR CONDITIONING, CRUISE CONTROL, USB PORT, AUX PORT, LEATHER 3-SPOKE MULTI-FUNCTION STEERING WHEEL, ELECTRIC FRONT WINDOWS, ELECTRIC MIRRORS & IT HAS TWO SETS OF REMOTE KEY FOBS. THIS VEHICLE IS STILL UNDER MANUFACTURES WARRANTY UNTIL 16/05/2021. 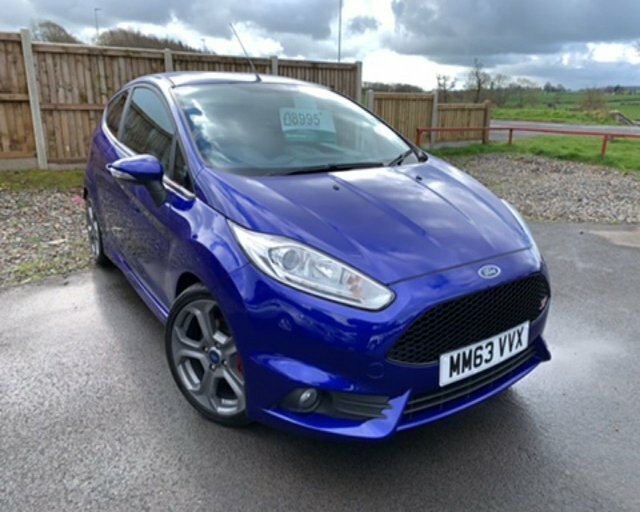 HERE WE HAVE FOR SALE A FORD FIESTA 1.0 ST-LINE 3-DOOR, FINISHED IN DEEP IMPACT BLUE METALLIC WHICH IS COMPLIMENTED BY GREY CLOTH UPHOLSTERY. THERE HAVE BEEN TWO REGISTERED KEEPERS FROM NEW & IT COMES COMPLETE WITH A FULL SERVICE HISTORY UP TO 29/10/2018 @ 11200 MILES, THERE ARE TWO STAMPS IN THE BOOK CARRIED OUT BY NONE FRANCHISE GARAGE. DUE TO THE EXTREMELY LOW CO2 EMISSIONS, THE ROAD TAX IS NIL COST !!! STANDARD SPECIFICATION INCLUDES COLOUR SATELLITE NAVIGATION, BLUETOOTH CONNECTIVITY, DAB RADIO, AIR CONDITIONING, QUICK CLEAR HEATED FRONT WINDSCREEN, 17 INCH 8-SPOKE ALLOY WHEELS FINISHED IN STEEL GREY, ELECTRIC FRONT WINDOWS, ELECTRIC MIRRORS, AUX PORT, USB PORT, CENTRE ARMREST & IT HAS TWO SETS OF REMOTE KEY FOBS. 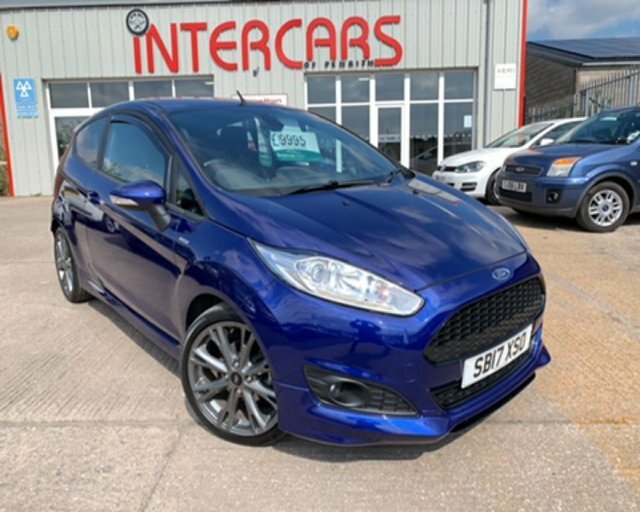 2013 63 FORD FIESTA 1.6 ST-2 3 DOOR 180 BHP FINISHED IN PERFORMANCE BLUE WHICH IS COMPLIMENTED WITH THE ST RECARO LEATHER TRIMMED SPORTS SEATS. THERE HAVE BEEN TWO REGISTERED KEEPERS FROM NEW & IT COMES COMPLETE WITH A FULL SERVICE HISTORY UP TO 23/01/2019 @ 54400 MILES, THERE ARE THREE STAMP;S IN THE BOOK. THIS STUNNING HOT HATCH COMES WITH FEATURES SUCH AS 5 SPOKE GRAPHITE ALLOY WHEELS, FRONT FOG LIGHTS, BOOT SPOILER AND ST BODY KIT, TWIN CHROME TAIL PIPES, CLIMATE CONTROL, HEATED FRONT SEATS, PUSH BUTTON START, VOICE CONTROL BLUE TOOTH HANDS FREE CONNECTIVITY, AND A 6 SPEED GEARBOX. CALL US TODAY ON 01768840111 TO ARRANGE A TEST DRIVE AND VIEWING WE OFFER EXCELLENT P/X PRICES AND FINANCE PACKAGES TO SUIT EVERY BUDGET. THIS RECENT ARRIVAL IN TO OUR STOCK IS A FORD FIESTA ZETEC 1.5 TDCI 5-DOOR 75 BHP, FINISHED IN RACE RED WHICH IS COMPLIMENTED BY A GREY CLOTH UPHOLSTERY. THERE HAVE BEEN TWO REGISTERED KEEPERS FROM NEW & IT COMES COMPLETE WITH A PART SERVICE HISTORY, THERE IS ONE SERVICE PRINT OUT ON 29/10/2018 @ 45207 MILES. DUE TO THE EXTREMELY LOW CO2 EMISSIONS, THE ROAD TAX IS NIL COST !!! STANDARD SPECIFICATION INCLUDES BLUETOOTH CONNECTIVITY, QUICK CLEAR HEATED FRONT WINDSCREEN, 15 INCH 5 DOUBLE-SPOKE ALLOY WHEELS, AIR CONDITIONING, USB PORT, AUX PORT, ELECTRIC FRONT WINDOWS, ELECTRIC MIRRORS & IT HAS TWO SETS OF REMOTE KEY FOBS. 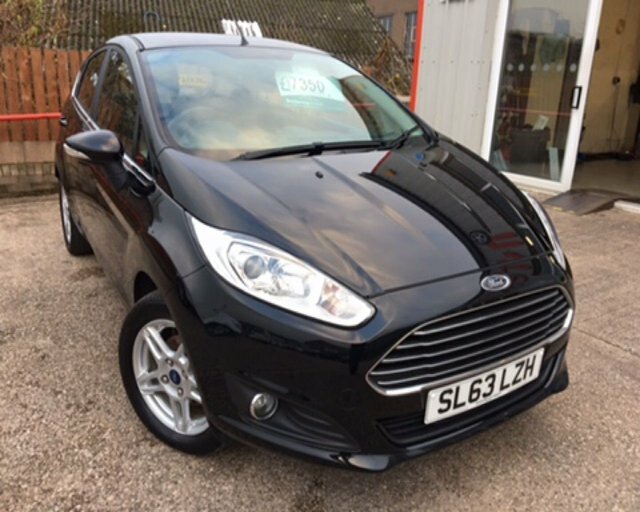 2013 13 FORD FIESTA 1.2 ZETEC 5 DOOR 81 BHP FINISHED IN PANTHER BLACK WHICH IS COMPLEMENTED WITH GREY CLOTH ZETEC INTERIOR. THIS IS A STUNNING EXAMPLE THAT COMES WITH A FULL SERVICE HISTORY ( 4 STAMPS ) AND HAS BEEN MAINTAINED TO THE HIGHEST STANDARD. THE ZETEC COMES WITH MANY FEATURES SUCH AS ALLOY WHEELS, AIR CONDITIONING, FRONT FOG LIGHTS, BLUE TOOTH HANDS FREE CONNECTIVITY, AIR CONDITIONING, FRONT ELECTRIC WINDOWS AND MIRRORS, CALL US ON 01768840111 TO ARRANGE A TEST DRIVE AND VIEWING WE OFFER EXCELLENT P/X PRICES AND FINANCE PACKAGES TAYLOR MADE TO SUIT EVERY BUDGET. 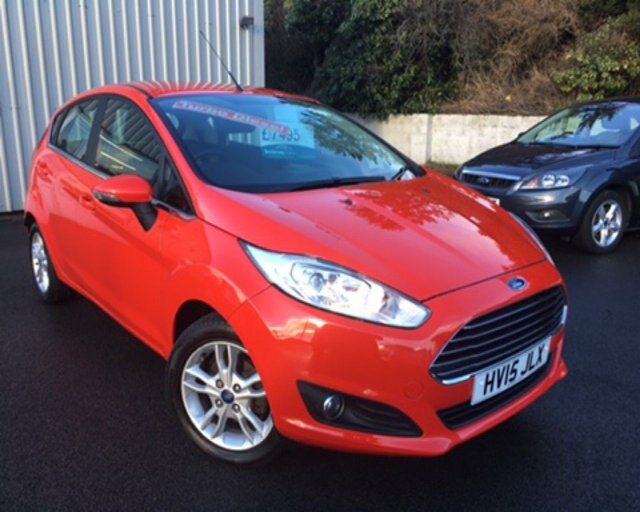 THIS NEW ARRIVAL IN TO OUR STOCK IS A FORD FIESTA 1.2 ZETEC 5-DOOR 82 BHP, FINISHED IN RACE RED WHICH IS COMPLIMENTED BY A BLACK CLOTH UPHOLSTERY. THERE HAVE BEEN TWO REGISTERED KEEPERS FROM NEW & IT COMES COMPLETE WITH AN EXCELLENT SERVICE HISTORY, THERE ARE TWO STAMPS IN THE BOOK UP TO 27/02/2018 ' 28859 MILES. DUE TO THE EXTREMELY LOW CO2 EMISSIONS, THE ROAD TAX IS ONLY £30 PER YEAR !!! STANDARD SPECIFICATION INCLUDES BLUETOOTH CONNECTIVITY, QUICK CLEAR HEATED FRONT WINDSCREEN, 15 INCH 5 DOUBLE-SPOKE ALLOY WHEELS, AIR CONDITIONING, AUX PORT, USB PORT, ELECTRIC FRONT WINDOWS, ELECTRIC MIRRORS, FULL SIZE STEEL SPARE WHEEL & IT HAS TWO SETS OF REMOTE KEY FOBS. 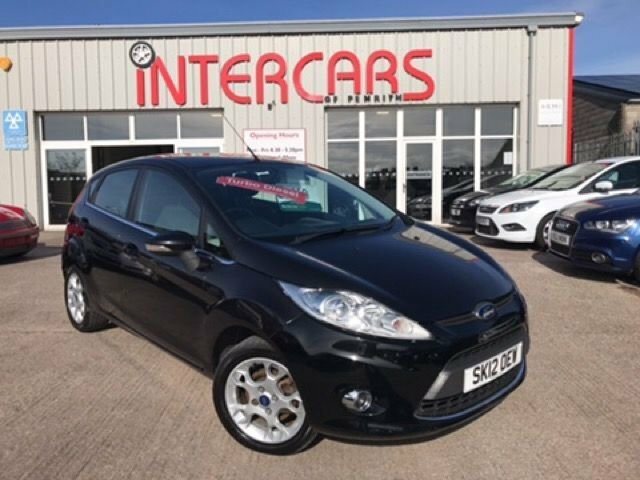 2012 12 FORD FIESTA 1.4 TDCI ZETEC 5 DOOR FINISHED IN PANTHER BLACK WHICH IS COMPLEMENTED WITH CLOTH INTERIOR. THE CAR COMES WITH A FULL SERVICE HISTORY AND IS IN GREAT CONDITION THROUGHOUT. FEATURES THAT COME ON THE ZETEC MODEL INCLUDE ALLOY WHEELS, FRONT FOG LIGHTS, HEATED FRONT SCREEN, MEDIA CONNECTIVITY, REAR PARKING SENSORS, AIR CONDITIONING, FRONT ELECTRIC WINDOWS AND MIRRORS AND TWO REMOTE KEY FOBS. CALL US ON 01768840111 TO ARRANGE A TEST DRIVE AND VIEWING WE OFFER EXCELLENT P/X PRICES AND FINANCE PACKAGES THAT SUIT ANY BUDGET. The Ford Fiesta didn't become the UK's best-selling car of all time for no reason. The British car-buying public took this iconic supermini to their hearts long ago and it continues to sell in huge numbers. Attractive, fun to drive, cheap to run and practical too, the Fiesta has plenty to recommend it. 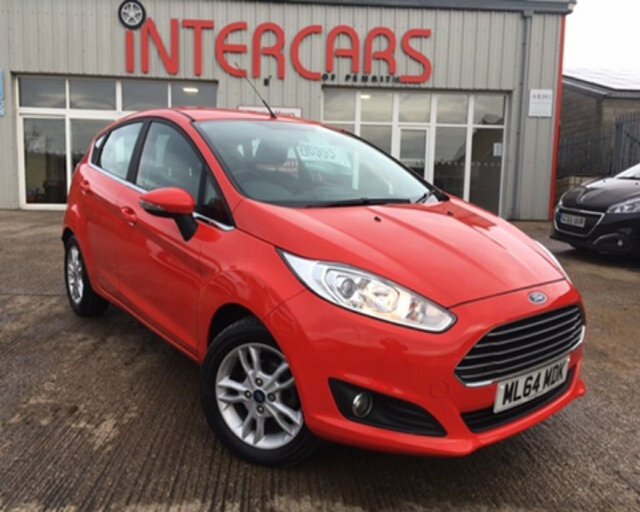 Why not get behind the wheel of a used Ford Fiesta in Carlisle today by coming to Intercars Of Carlisle Ltd and arranging a test drive. We'll always go above and beyond to help you find the right vehicle to suit your requirements. Get in touch with a member of the showroom team now to discuss your requirements.